AEM continues to lead the way with innovative products that push the envelope of what is possible. Check out the Recently Listed Air Intake Inlet Tubes, Elbows, and Components. 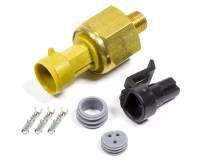 AEM Air Bypass Valve - 3 in. Pit Stop USA is The Online Motorsports Superstore! AEM was founded in 1987 as a tuning performance shop catering to vintage automobiles and the latest trend in street racing, modified imports. Cars and drivers sporting AEMas bright yellow logo became famous in the street racing scene for one consistent reason, they won races. AEM developed one of the first Packaged Air Induction Systems and it came right out of their experience in dyno testing, understanding intake energy dynamics and racing at the Battle of the Imports. AEM has been a leader in the development and sale of precision tuned induction systems ever since that fateful day at the Battle of the Imports. Today, the Companyas induction systems number in the hundreds and AEM is still the one to beat. AEM was one of the first companies to engineer and design performance aftermarket induction systems with specific tube lengths and diameters to take advantage of pressure waves in the inlet tract. 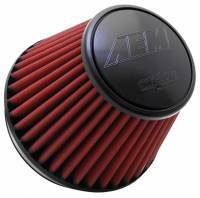 AEM began to explore the advantages of cooler air on combustion efficiency way back in the mid nineties and coined the phrase Cold Air Intake. AEM worked with K&N in 1999 to design conical air filters with built in air horns at the filter base to greatly enhance air flow into the inlet duct. 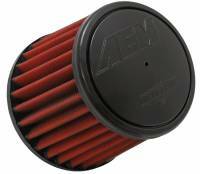 AEM developed the first dual chamber intake kits designed to generate more power over a broad RPM range. AEM continues to lead the way with innovative products that push the envelope of what is possible. That is why you will find them under the hoods of many of the best racing teams and industry experts nationwide. 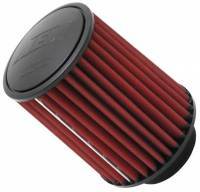 AEM DRYFLOW air filters do not use oil so there is no chance of over-oiling your filter which takes the guesswork out of servicing. 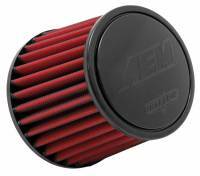 AEM DRYFLOW air filters do not use oil so there is no chance of over-oiling your filter which takes the guesswork out of servicing. 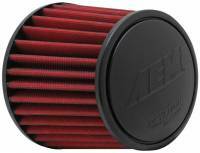 We feature AEM Induction Systems products including AEM Dryflow Air Filters at low everyday prices.